Native Chicagoan Beth Finke knows first-hand how Social Security can benefit children and their families. As the youngest in a family of seven children, she became a first-time Social Security recipient at three-years-old following the death of her father. At the time, four of her brothers and sisters also lived at home. Beth and her siblings received Social Security survivor benefits, which allowed her mother to make ends meet. At age 26, Beth lost her sight from a rare disease called diabetic retinopathy. As she adjusted to her vision loss, the education that she received from Social Security survivor benefits became even more critical to her future success. With the aid of a talking computer and the skills she learned as a journalism major, Beth launched a successful career as a writer. Now an award-winning author, teacher, and speaker, Beth credits Social Security for enabling her to support herself as an adult and to give back to others. 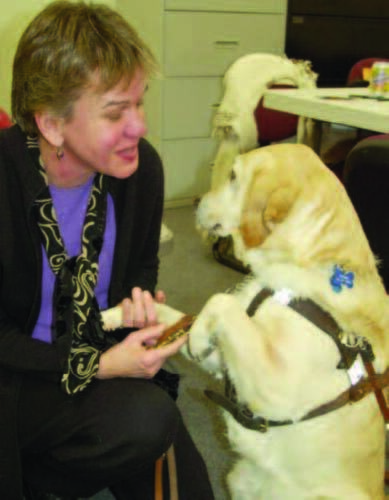 Today at 52, she often speaks to young children about her experiences and reads to them from her children’s about her guide dog Hanni.